January saw me coaxed, bleary eyed, from my cosy studio, and thrust in front of a classroom of 25 students, fresh back from the Christmas break. 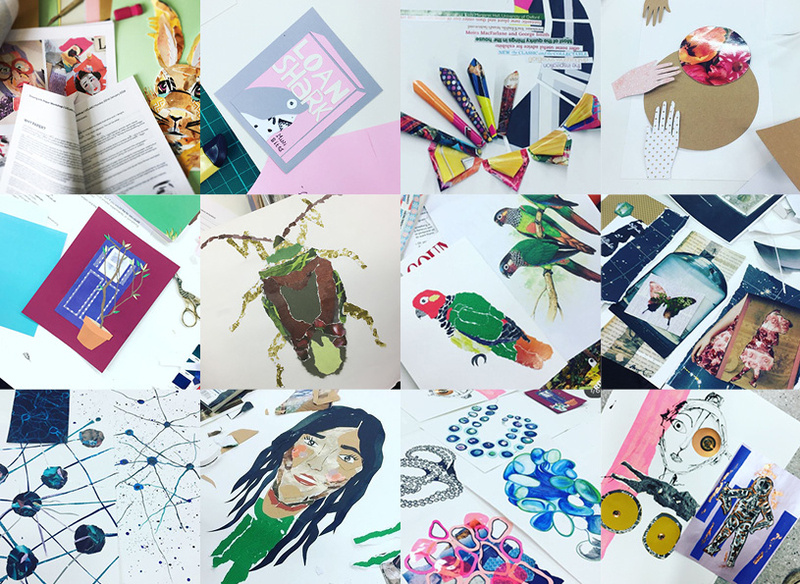 I went up to visit the impressive textiles department at UCLAN University, to chat about my career path so far and get the students to have a crack at what I'm currently referring to as 'drawing with paper' (or, collage, if you must ;) ). The students were a mix of 1st, 2nd, 3rd years, and Masters - so a real mix. As paper illustration is still a relatively new thing for me, I wasn't initially sure how to go about holding a workshop - as its not something you really 'teach' as such, its more about having a go with the medium and losing yourself in it a bit. So this is basically what we did for the afternoon! After a short talk about my work and how I wound my way to where I am now, the students got stuck in with the paper and glue - and the results were inspiring. Such a wide variety of styles and subject matter, it was really exciting to see their creations developing throughout the session. I was really impressed with the directions that they took the technique, and how they began to apply it to their own way of working. I hope the students had fun, I had a lovely afternoon - thanks for having me UCLAN!